Belated happy birthday greetings to local resident, Freda Miles (née Webb), who turned 101 years old on 22 August. Freda was born in Northamptonshire England, where she worked as a tailor. She and husband Reg married in 1938 just prior to World War II; she recalls that they were only bombed ‘a couple of times’! At the suggestion of Reg’s friend who had settled in Vermont, the family left England on 15 April 1949 bound for Australia on P&O’s Chitral. Reg built their home in Carinya Road Vermont, second daughter Jenny was born and his building company Miles & Conlin began. Quickly becoming part of the local community, the family attended nearby St Luke’s Anglican Church where Freda was a member of the choir for 25 years. When Reg died in 1989, Freda volunteered at the local Salvation Army Op Shop which she managed for seven years until they decided she was too old and must leave; she adamantly refused until management made her leave the premises. Customers decided to shop elsewhere and the shop closed. Freda was still working four days a week at a Canterbury Road Op Shop when she turned 100. Much fuss was made on the day which she celebrated while working at the shop. However, shortly after they decided that Freda was too old and unceremoniously deprived her of the role she had so faithfully undertaken for 23 years. Luckily another Op Shop Freda had assisted since 2010 for one day a week, welcomed her with open arms; she now she spends six days a week serving behind the counter of Youth Education Support’s Op Shop in Forest Hill where she is also their Ambassador. By the way, quite a few of Freda’s colleagues, outraged at her treatment at the former Op Shop, walked out when she was made to leave. Some now volunteer with her and customers too followed Freda, so it was a win-win for YES. Some other volunteer roles include cooking meals at home for the Salvation Army who distributed them to the sick and elderly, and delivering Neighbourhood Watch newsletters, which she still does. 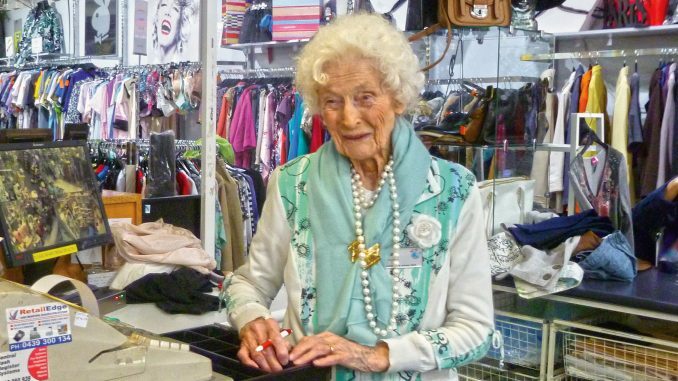 Freda, well-known and much-loved by her many op-shop fans, is a well-spoken, immaculately attired, slender lady with a bright smile, courteous manner and superior customer service skills. Her 101st birthday was celebrated at work at the op shop (of course). YES Inc. Ambassador Freda’s message: There is a growing number of young people in need. Every dollar that we receive is respected and passionately used to ease the plight of these worthy young members of our community. … This is certainly a blessed mission for me to support and contribute to at 101 years of age. Freda, who has two granddaughters and two great-grandsons, attributes her longevity to the fact that she’s never smoked and has always been a great walker. Sitting at home knitting is not an option for this sprightly, intelligent centenarian. Roll on 102! Post-war, the Australian government had embarked on a campaign to encourage – mostly British – immigration. The catch-cry of the time was ‘populate or perish’. Adult emigrants were charged £10 for their fare (children travelled free) and became known as £10 Poms. They were drawn by promises of employment, housing, climate and lifestyle. Sometimes their dreams were not realised and about one-quarter returned home within a few years of their arrival. Not so Freda and Reg. There had been fears of post-war unemployment but for many years the unemployment figure remained very low. Labour shortages were especially acute in the building industry and progress in home-building was slow. Many saw large-scale immigration as a solution but lack of shipping resulted in few arrivals before 1948. Although the housing shortage remained serious, by 1949 more than 130 000 houses and flats had been built and the number of factories almost doubled since pre-war years.